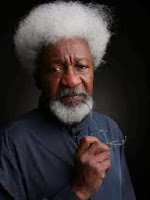 Nigerian Biography: Biography of Wole Soyinka; Author; Ogun State Celebrity. Biography of Wole Soyinka; Author; Ogun State Celebrity. Soyinka’s father, Samuel Ayodele Soyinka was a recognized member of the Anglican Church and the headmaster of St. Peters School, Abeokuta. His mother, Grace Eniola Soyinka was a trader and a member of the Ramsome-Kuti family. Soyinka attended St. Peters Primary School, Abeokuta and afterwards, proceeded to Abeokuta Grammar School where he was notable for excellence in literary composition, for which he also won several awards. In 1946, he gained admission into Government College Ibadan where he completed his secondary education in 1952. In the same year, he gained admission into the University College, Ibadan, an affiliate of University of London, where he studied English Literature, Greek, and Western History. While still studying in the University Wole Soyinka, in conjunction with some other friends of his, founded the Pyrates Confraternity, to fight corruption and enthrone justice in the university. Between the years 1954 and 1957, Wole Soyinka moved to the Leeds University where he continued his studies in English literature. Wole Soyinka worked at the Royal Court Theatre in London. He wrote a lot of plays that were produced in both Nigeria and United Kingdom, in theaters and on radio. Soyinka participated actively in the politics that shaped the Nigeria's history and the struggle for independence. During the Civil War, he was arrested by the federal government of General Yakubu Gowon and put in solitary confinement for two years, just for standing strongly against the injustice of those days. Soyinka also stood strongly against the tyranny of the military administrations in Nigeria especially that of late General Sani Abacha. Wole Soyinka was made a professor first at Cornell University and then at Emory University in Atlanta. In 1996 he was appointed Robert W. Woodruff Professor. He is also a lecturer in universities of Oxford, Harvard and Yale. Soyinka was a professor of Comparative Literature at the Obafemi Awolowo University, between the years 1975 and 1999, a Professor of Creative Writing at the University of Nevada, Las Vegas, Professor at Loyola Marymount University in Los Angeles, California, US. In the year 1986, Soyinka was awarded the Nobel Prize for Literature. This made him the first African Nobel laureate. Labels: Authors, Celebs, Heroes, Ogun State Celebrities.